Second studio album by the French proggers, "Le Cimetière Des Arlequins" was the first ANGE album I listened to and still remains my favorite today. Why? Maybe because of its overall particular hazy and mystical atmosphere the music delivers through fantasy, haunting and mysterious ambiances. This impression is mainly due to the predominance of the band's unique spacey mellotron-like sonority, created by Francis Décamps by reverberating a Viscount organ through a Hammond organ. More modern than its predecessor, the disc was very innovative and exciting for 1973 - especially considering the French rather radio-friendly musical landscape at the time - but sounds quite dated nowadays. 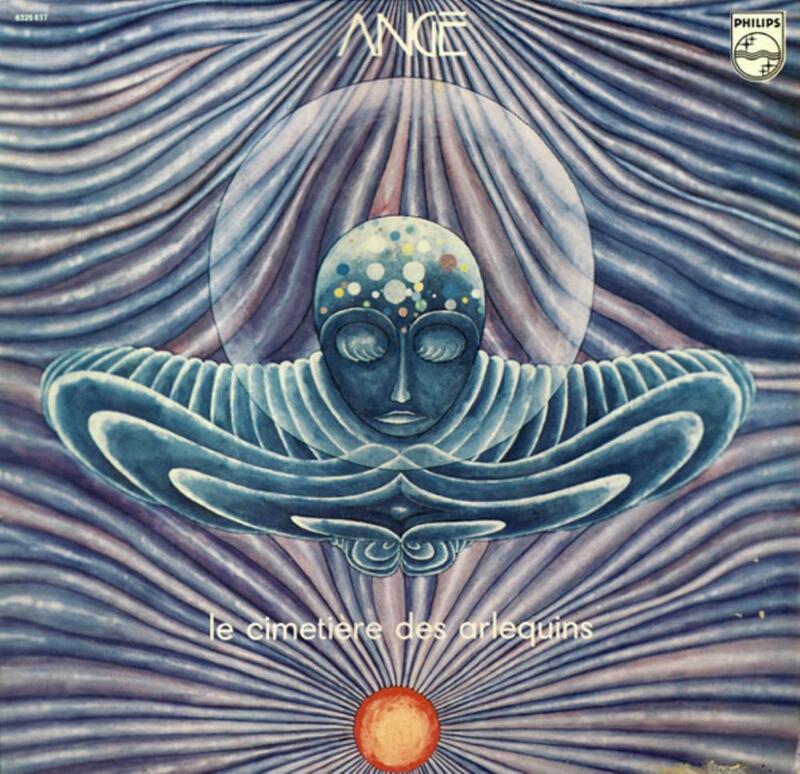 ANGE is often referred as the French GENESIS, but is this really the case? I can understand this comparison, as there were not many known symphonic prog bands in France in the 70's, however I do not find it entirely right. If you're a newcomer, a better description of the Décamps brothers and co.'s compositions would be something like 'chanson française-meets-medieval-meets-space-and-symphonic-rock', with more emphasis on eerie keyboards and theatricality than on virtuoso guitars and breathtaking passages. Furthermore, the tracks are shorter, with more conventional durations. The important word is: atmosphere. The record opens with the surprising spacey cover of the famous Jacques Brel's song "Ces gens-là". Nice and original, ANGE chose not to include the "Frida" section, whose glorious and positive tone and lyrics contrast with the rest of the track. Once again, the band prefers to focus on satire. "Ces gens-là" will be released as a single and will be their first success, making them famous in France. Supported by the flute and somber organs, the medieval "Aujourd'hui c'est la fête chez l'apprenti sorcier" possesses an unusual progression. Alternating calm and even heavy guitar riffing passages, this composition is really good. Despite its repetitive and irritative beginning, the mysterious and haunting "Bivouac Première Partie" is quite pleasant, with a unexpected acceleration. On the contrary, "L'espionne lesbienne" is easily the weakest song of the disc. A boring sexual delirium. As its title suggests, "Bivouac Final" begins where "Bivouac Première Partie" ended. A powerful and somber kind of space rock. Then comes one of the few moments with a hopeful tone in this album, "De temps en temps". This lighter composition is pretty, but its ending is completely out of place. Inspired by Van Gogh's painting "Road with Cypress and Star", "La route aux cyprès" is an acoustic pause, where Christian Decamps and Daniel Haas plays a relaxing peaceful tune. Longest song of the record, the 9 minutes title track is also the darkest and features various ambiances: a little eccentric, gloomy and even scary as hell! Enjoyable although a bit uneven. With "Le Cimetière Des Arlequins", ANGE defines its own style and identity: a magical elixir of medieval, spacey, spooky and symphonic progressive poetry, with slight heavy touches. Fairytale organs and some guitar riffs create a somber and mysterious atmosphere serving a theatrical singing. This second opus from the Frenchs may well be their most sinister and spaciest offering, and therefore possesses its own particular charm.